There are some good stories out there why fall color happens with credits to the changing temperatures, and a hot summer and wet fall and the best one "Jack Frost". While there clearly is some truth to changing temperatures and adequate moisture, Mr. Frost has little to do with the fall colors we enjoy. In fact, if we have an early frost that will be the end of our fall color. Fall colors are the result of what is already within the leaves. There are several color pigment groups that produce those vivid reds, golds and oranges and even tans. One of those groups is with us and very obvious all summer, chlorophyll. 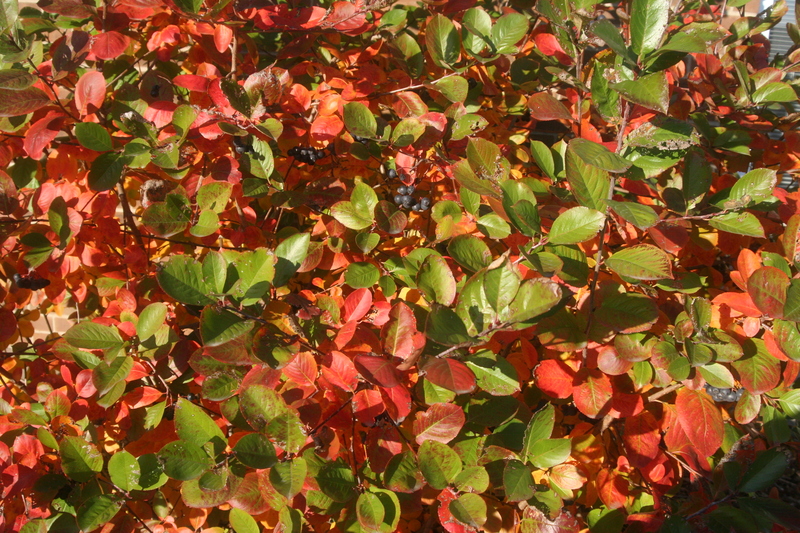 Green is the dominant pigment unless a plant is known for its variegated foliage. The clear yellow fall color comes from xanthophyll pigments and seen on many plants that do not have strong amounts of other pigments. Plants that fire up with orange, some yellow and red colors come from carotenoid pigments (think carrots). The really showy colors of dark red, crimson and scarlet come from the last ground of pigments called anthocyanin's. The last group of pigments and the ones considered least attractive are the tannins, giving us the deep browns and tans. Fall color is determined by the genetics of plant plus the weather conditions we have each fall preceded by the kind of summer we have. There is always the potential for great fall color, the weather determines just how intense those colors are and how long they last. Examples are the yellow of birch trees, the reds of the red oak or the orange of the Ohio buckeye. The weather influences the intensity of color by the amount of sunlight, air temperatures, how healthy the plant is and the amounts of soluble sugar in the plant and foliage. Already mentioned was the dominance of the chlorophyll, but just below that are the xanthophyll's and carotenoids giving the us the yellows. Those two pigments are always there; we just won't seem them until fall when the chlorophylls break down. The best temperature range will be those days with nights between 40 and 45 degrees and lots of sunshine during day generating those sugars for those reds. Cloudy days generate less sugars for less intense fall colors. The best chance of a good long season of fall colors does start back in the summer with plants getting enough rain or water from the hose keeping them healthy. Thinking of our summer and fall so far, rainfall has not been a problem and we have been having some of those cool nights and warm days that will promote good strong fall colors. The last thing we want is to have Mr. Frost visiting early. Beside enjoying our local fall color, plan a weekend trip in Illinois or just over the boarder to the north and take in the color, it will be the last until next spring's green.